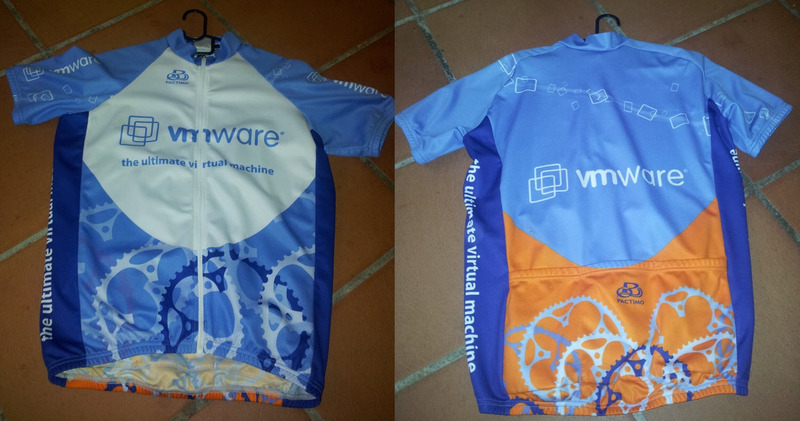 Earlier this week, I was pleasantly surprised to learn that we were working on a new 2017 VMware Cycling Kit! Kasey Linden, who works in our Federal team was leading this effort and was gauging interests internally. I was definitely interested and I had also suggested that we open this up to the general public as historically it was kept internal for logistical purposes. 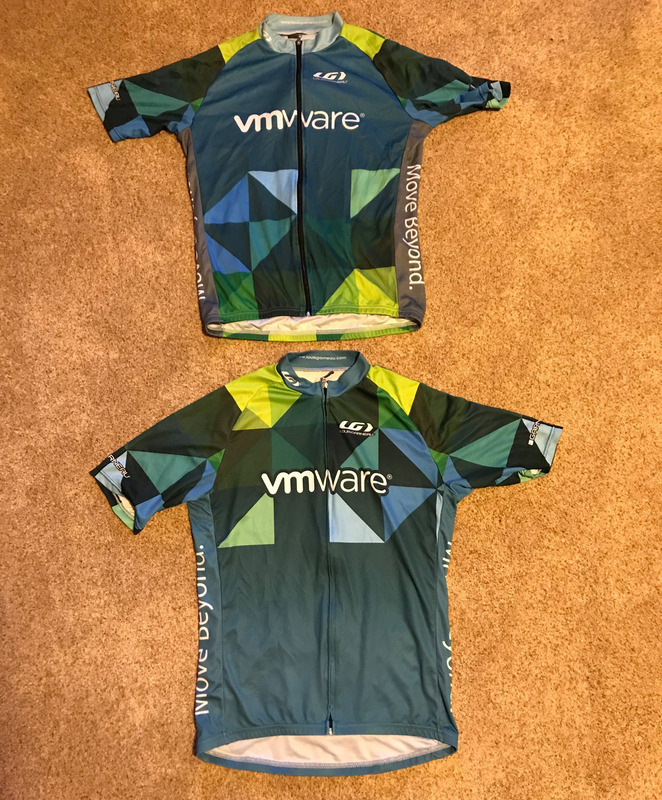 Not only did Kasey love the idea, but he plans to have the cycling kits available directly on the VMware Merchandise Store for anyone to purchase, which is huge if you ask me! As of right now, the designs are currently being worked on with the vendor and once that has been approved, it will go live on the VMware Store. We are hoping this should happen around mid to late September. I will continue to provide updates on this blog post as more information is made available, so feel free to check back every so often. 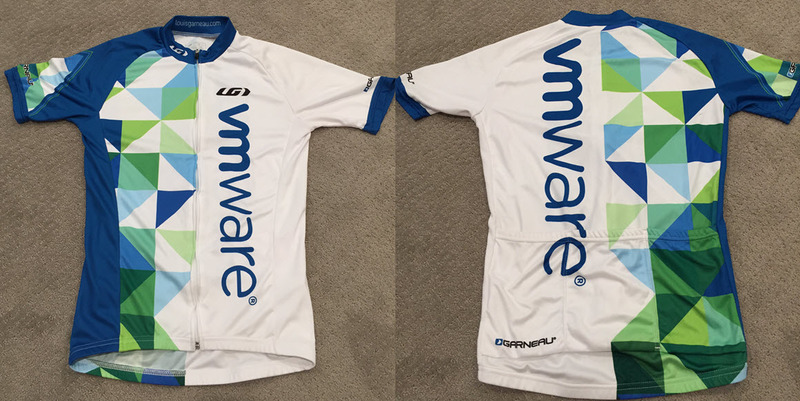 UPDATE (01/04/18) - I was just informed by Kasey the cycling kits are now live on the VMware Merchandise store. For your convenience, here is the URL for Mens gear and Women gear. UPDATE (09/28/17) - Great news from Kasey today! The cycling kit design just got done and has been approved. You can find the pictures of the kit below. The vendor will provide a pre-production to the team to validate the colors and then starting production and making them available directly on the VMware Store. UPDATE (08/22/17) - The google form https://goo.gl/forms/aZpWquKn47273VJJ3 was recently re-activated due to sizing issues with the previous vendor. I have been informed that we have now switched to Primal Wear as the new vendor. For folks who have already submitted, Kasey has reached out to everyone to have them re-submit and for new folks, just have a look at the sizing guide for more information. UPDATE (08/07/17) - We just received the sizing document from the vendor, which you can find here. We have also opened up a Google Form for those interested in taking part in the initial purchase. Please READ ALL details before submitting. Here's the link https://goo.gl/forms/aZpWquKn47273VJJ3 to the form and feel free to share this with others who are also interested. 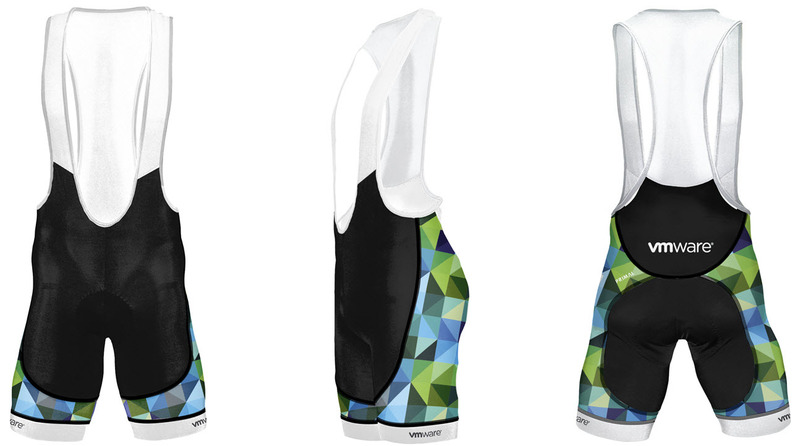 I had used this kit for the Wave2Wines BikeMS ride. I’ll be watching for this! Awesome! Do you think there will be matching bib shorts too? Quick one – will we be able to convert the design to a tri-top? I don’t solely ride bikes, a triathlon top would be ace. Watching as well. Please be sure to list fit info (slim, standard, relaxed), as I’m in between sizes. Awesome! Im in. Hoping that the kit will be able to be ordered in pieces. Id like a set of arm warmers, gloves and jersey. I may not need the shorts/bib shorts but would like the option. Any availability for the UK? YEAH!!! I will be in for sure on at least a jersey! And this will be my first VMWorld and I’m scheduled for your session, can’t wait! Awesome Thanks Will, looking forward to the launch! Are they available now? I could not spot them on the store and I want them absolutely! No, the kits aren’t available yet. We had some delays, so the new target ETA is mid/late Sept. I don’t see this listed on the site yet. Is it going to happen? Just for design inspiration – nice cycling kit from Sophos – https://shop.sophos.com/collections/cycling-gear . Thanks for leading this! With them being about 1 month out has a design been picked out yet? I assume no or you have posted it.